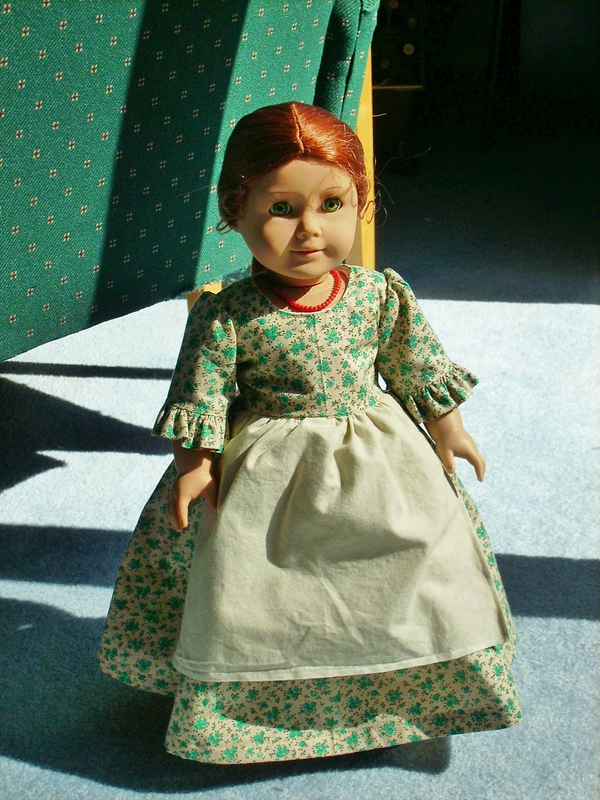 Today is 1940’s day for Doll Clothing week in honor of Nanea’s release over the summer. 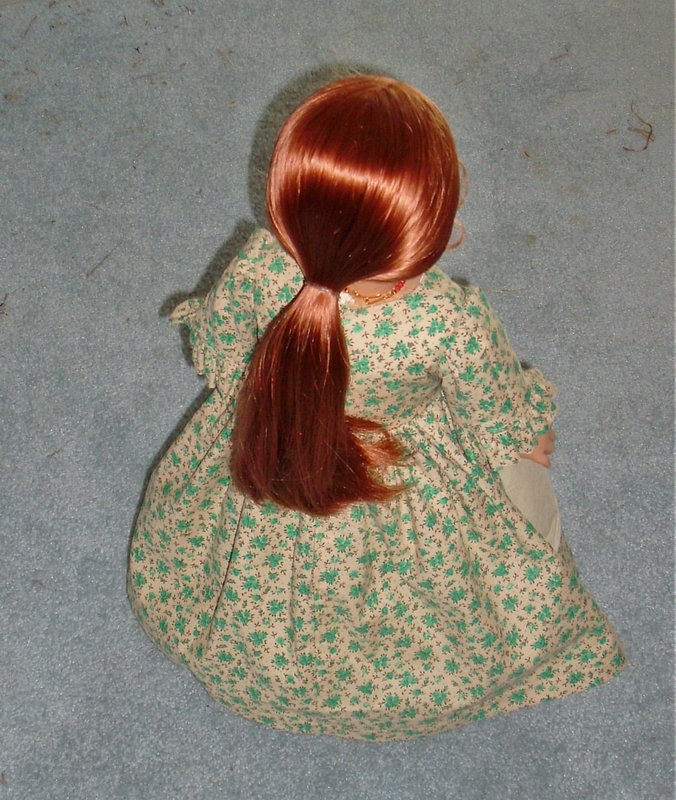 There are just so many different options; it was hard to narrow it down to one outfit for my dolls. I thought Nanea’s meet outfit was adorable, but then I also had Molly that I could try to recreate one of her outfits. I have Molly’s pretty clothing patterns. 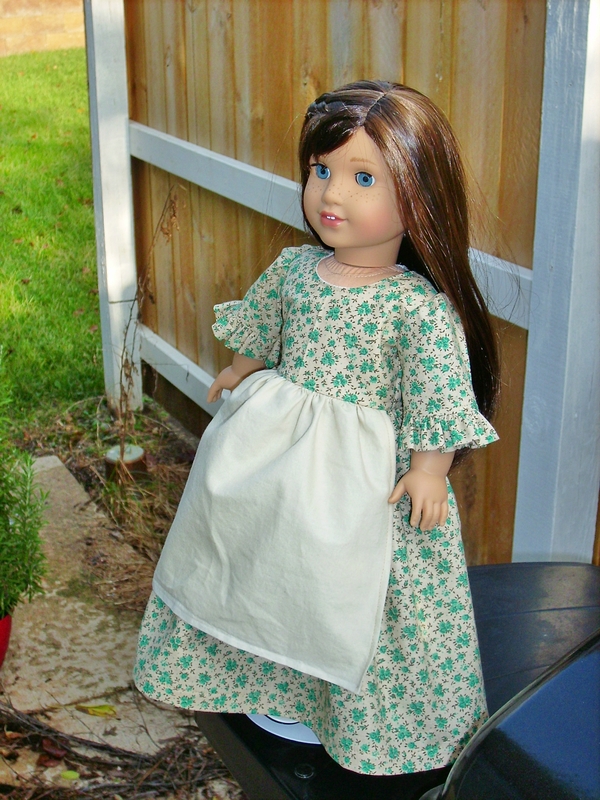 Then I thought about another KRVP dress and even bought some fabric for it but didn’t want to repeat the same dress that I made earlier this year. 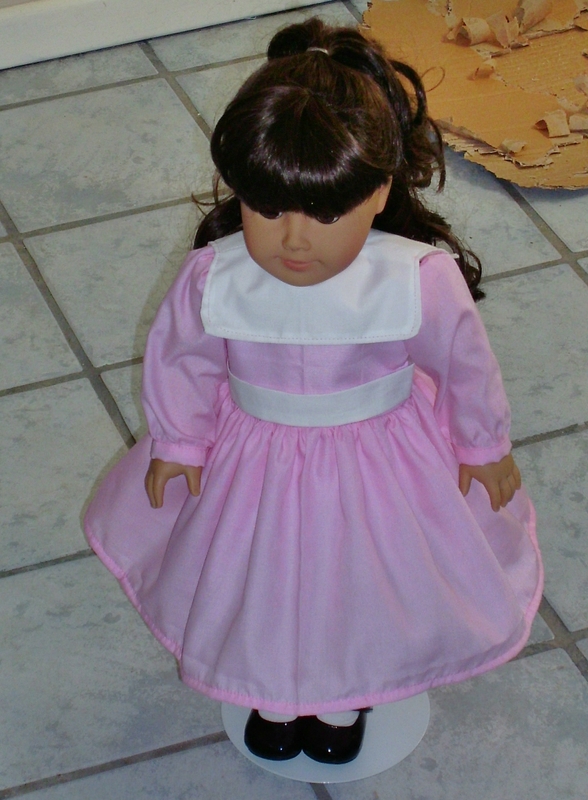 After that I thought about the “Heritage Doll Clothing” book too. In the end, Wren Feathers made my decision easy when she released her 1940’s Island patterns. 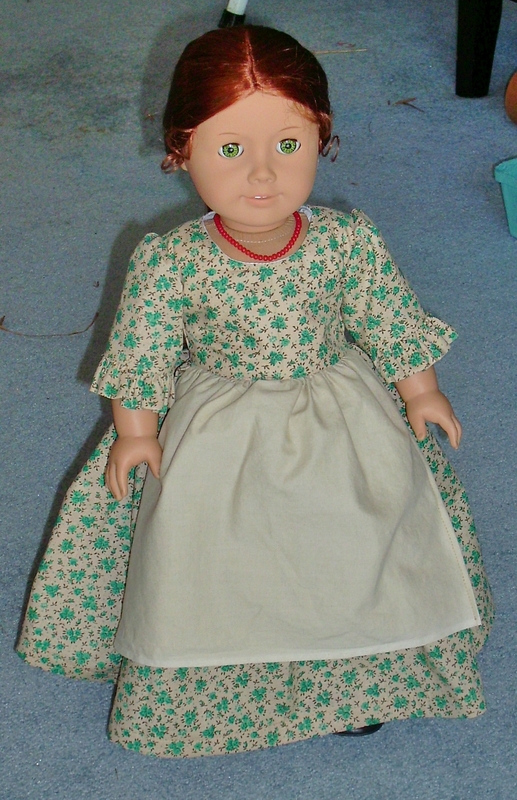 I decided that my Nanea doll needed the 1940’s Muumuu. The pattern came together fairly easily. 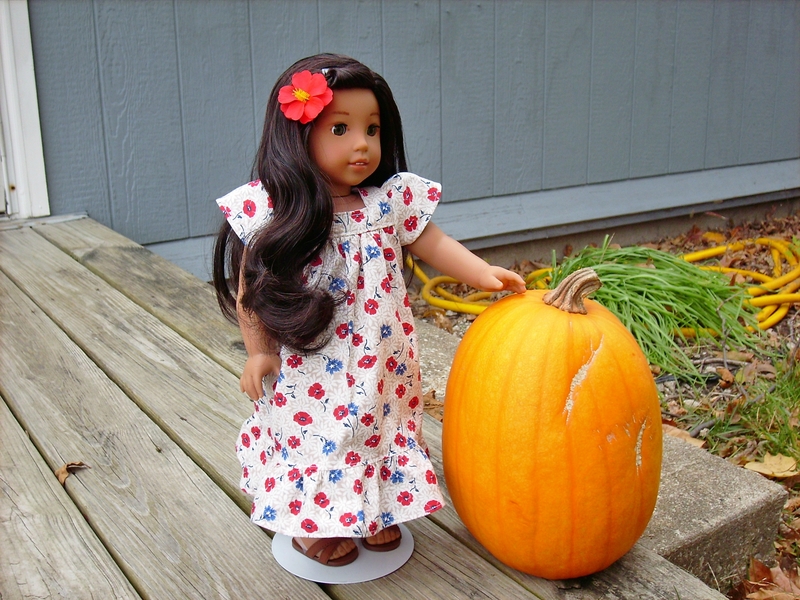 Nanea’s dress is made from quilting cotton. The yoke is lined with white cotton and I was able to get a great square neckline with this method. For the sleeve hem, I did a narrow rolled hem. My tip for this is to use a small zigzag stitch at the edge. This way I had something a little denser to be able to narrow roll. I use two passes of straight stitch for the hem; fold over once and stitch, then fold over again and stitch. I find I get better consistency doing the narrow hems this way. The only item I would do differently next time would be to make the ruffle piece longer. This is completely person opinion but when I look at Nanea, it seems like the bottom of my ruffle is pulling the dress in instead of flowing out more. I took Nanea out to my parents’ house over the weekend to show my mom the dress. 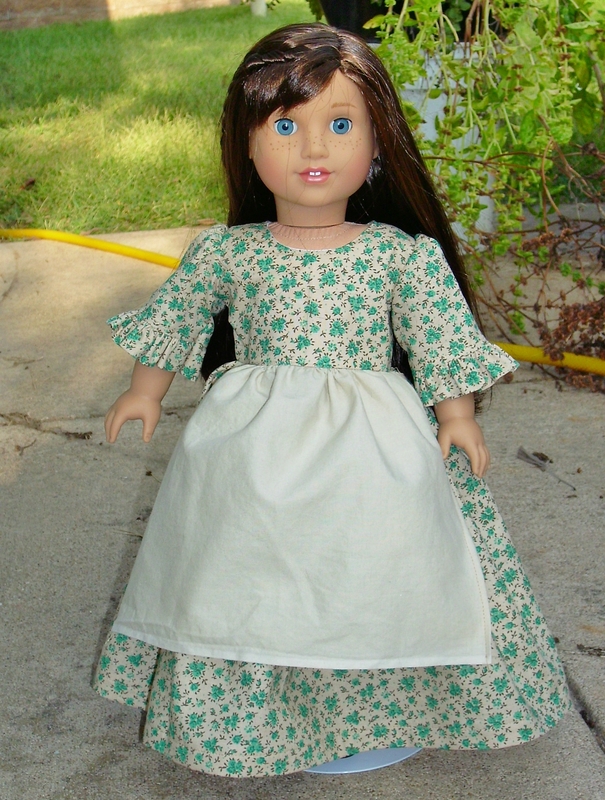 She said that this dress would have been a better meet dress for Nanea then the top and shorts she came with. My mom felt it had a better Hawaiian style to it. 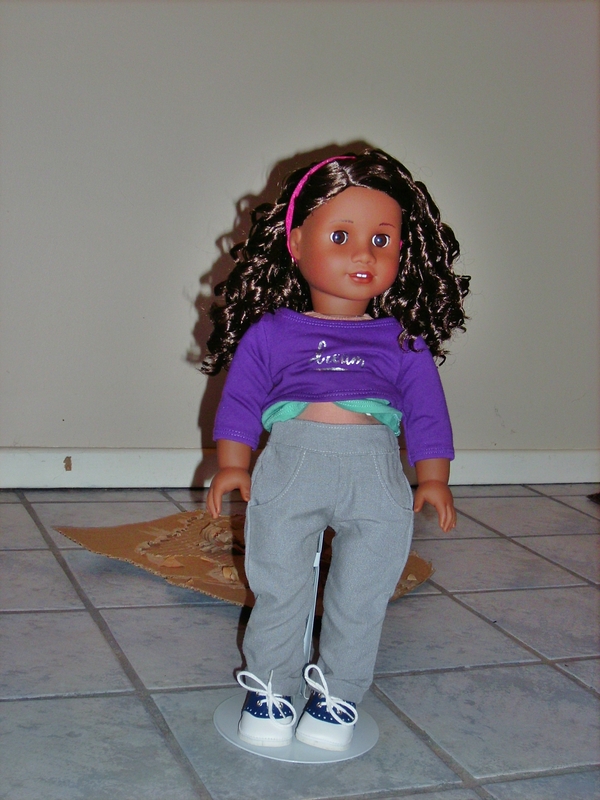 Today is Pants/ Jeans/ Shorts day for Doll Clothing Week. I decided to try out Simplicity 8397 for today’s challenge. 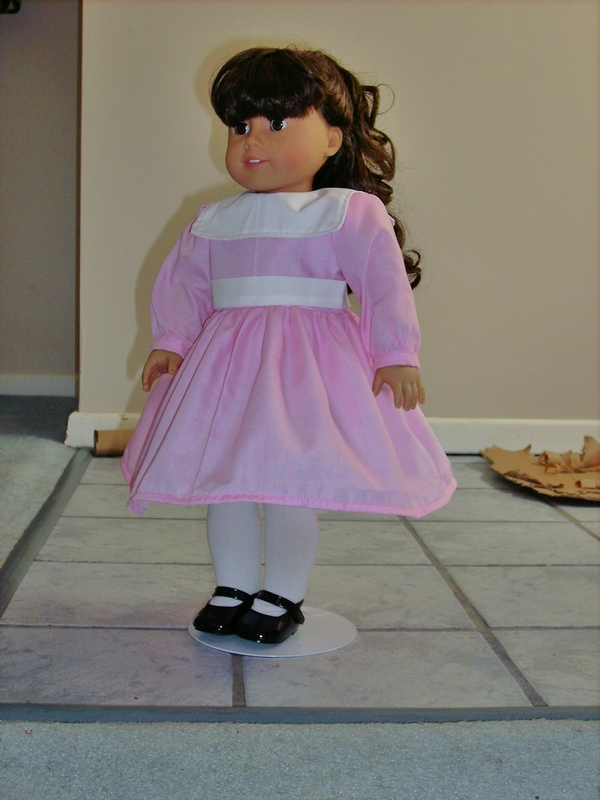 It is one of their American Girl collection line. Tell you how much I must have not liked the finished pants, I didn’t even realize until this morning I had not take pictures of them when I was going to post the review. I did view E (the long pants). I didn’t add the bias tape or buttons to the front. I didn’t have bias tape at home. Anyways, something basic would be more versatile. So being up front and honest, this is a mixed review. 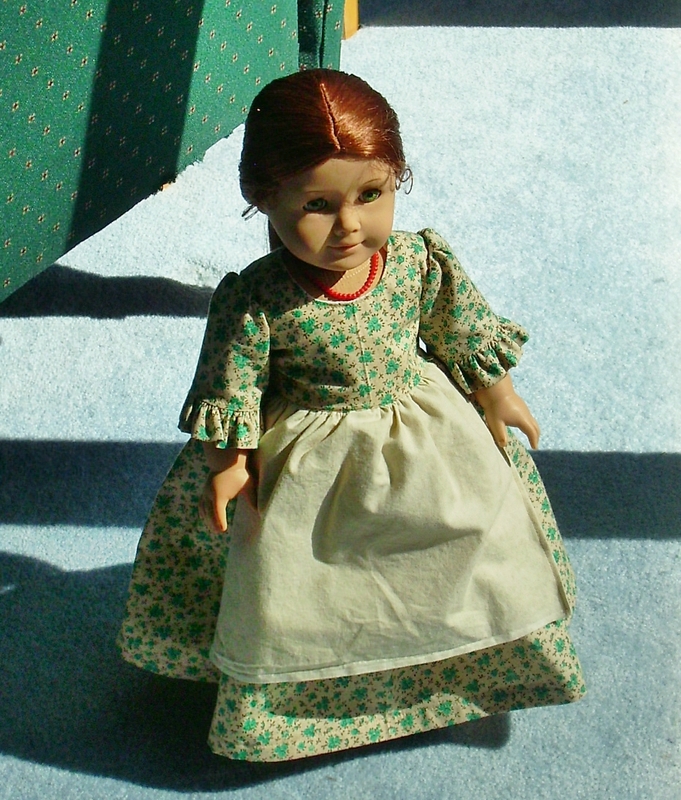 The pattern went together well, but ended up being over half an inch too big at the waist for my Gabriella doll. I know a bit of the problem was from fabric choice and cutting. But I can’t believe I was that far off that it made the pants that big. The pants have a Velcro closure in the back. I wasn’t expecting that. I am not sure I care much for that. But as this pair doesn’t fit, I am going to table that decision until I try a back Velcro closure that does fit my dolls. My absolute first recommendation if you use this pattern is to use a thin stable cotton. I used the linen look rayon/ poly for my pants. It was a bit temperamental in cutting out with my rotary cutter. So that probably didn’t help my pants out. Also, with the cuff, there is a lot of bulk at the hem of the pants. So a thin fabric will be better for that. My other recommendation is do not use your quarter- inch foot with this pattern. I honestly believe if I had used my 0 foot for my Pfaff, I would have at least had a closer to fitting pair of pant. 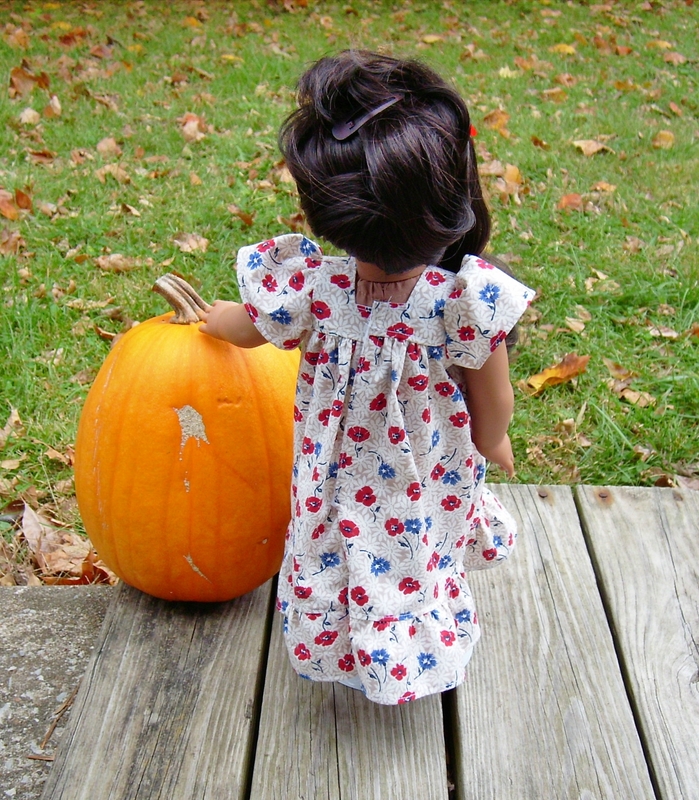 My honest guess is that this pattern is geared more towards someone who may not sew doll clothing as much and not have a quarter- inch foot for their sewing machine. 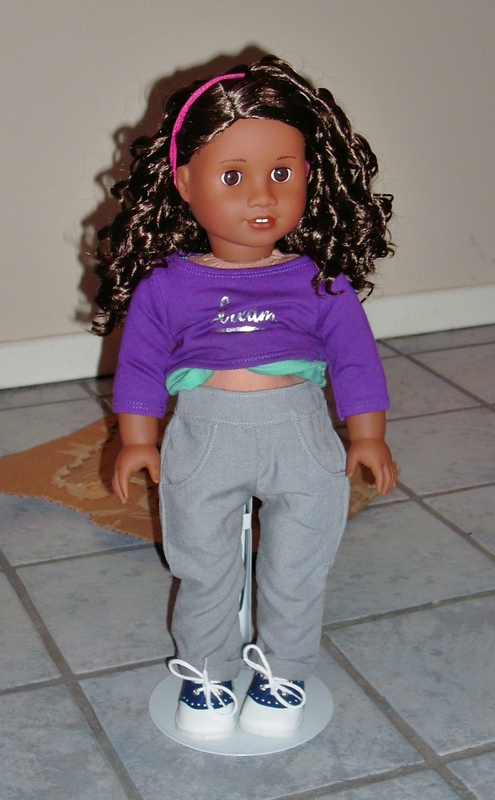 Finally, before installing the waistband, try the pants on your doll. If I had, then I would have been able to pull in the side seams and front crotch seam. But honestly, I didn’t expect them to be that big. 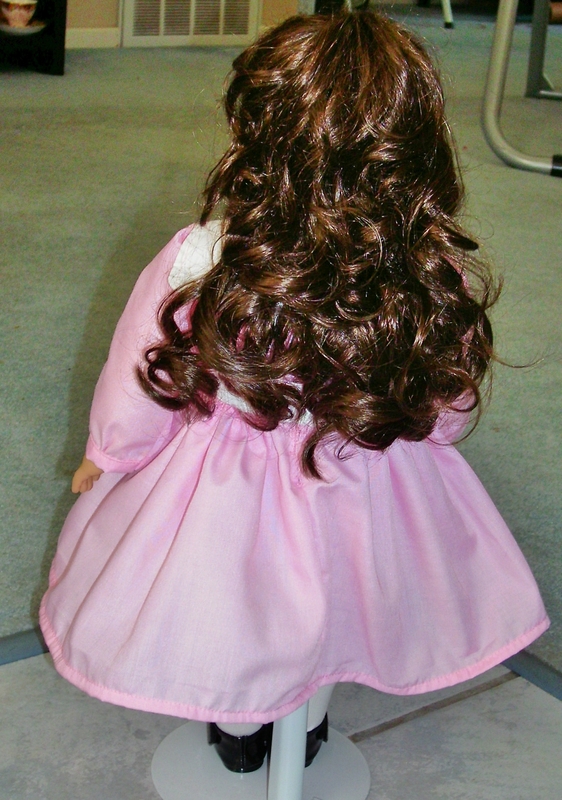 So I didn’t even think about trying them on Gabriella. 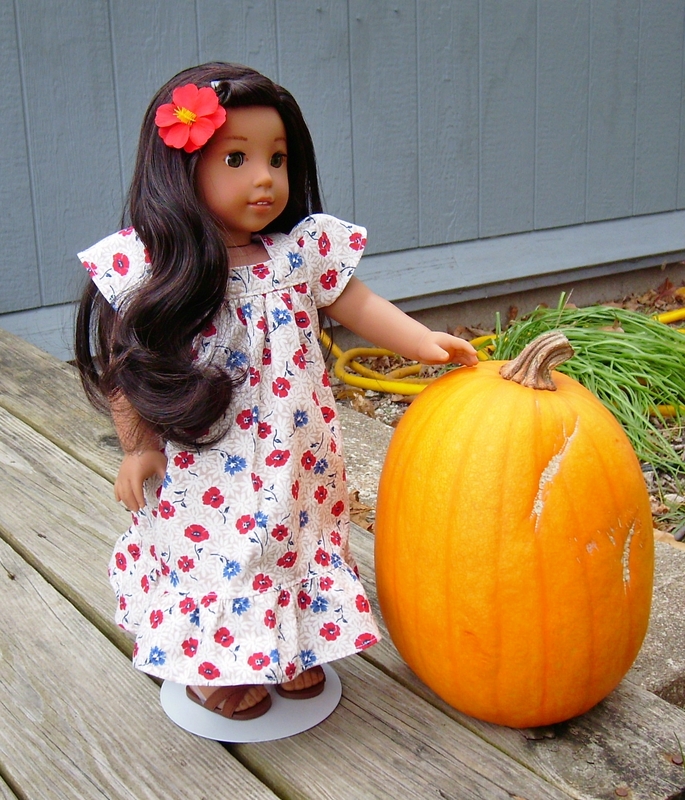 I think they were even too big for my older dolls. In the end, instead of removing the waistband and taking in side seams, I decided to just put a second strip of Velcro in the back. It takes care of most of the excess but not all. 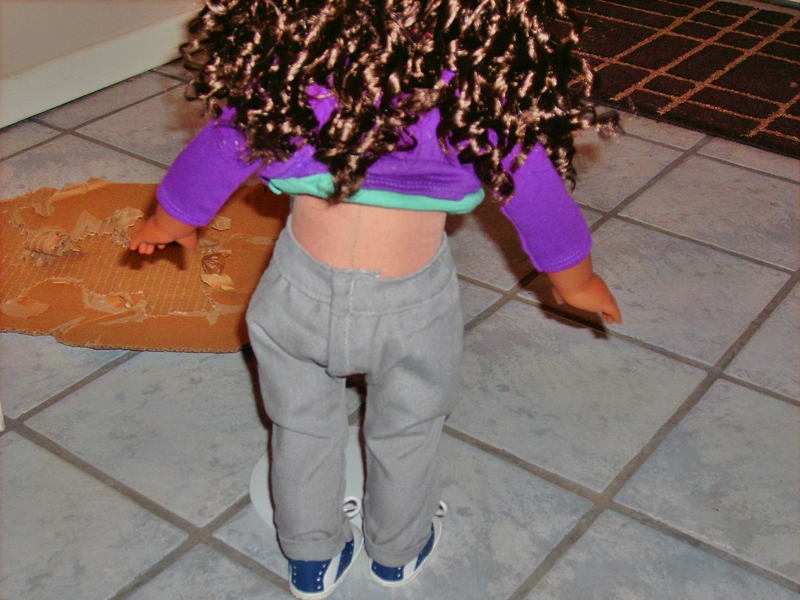 At least now, Gabriella’s pants are not falling off of her. Tell you how disappointed I was, I decided not to even bother making a top to go with this pair of pants. 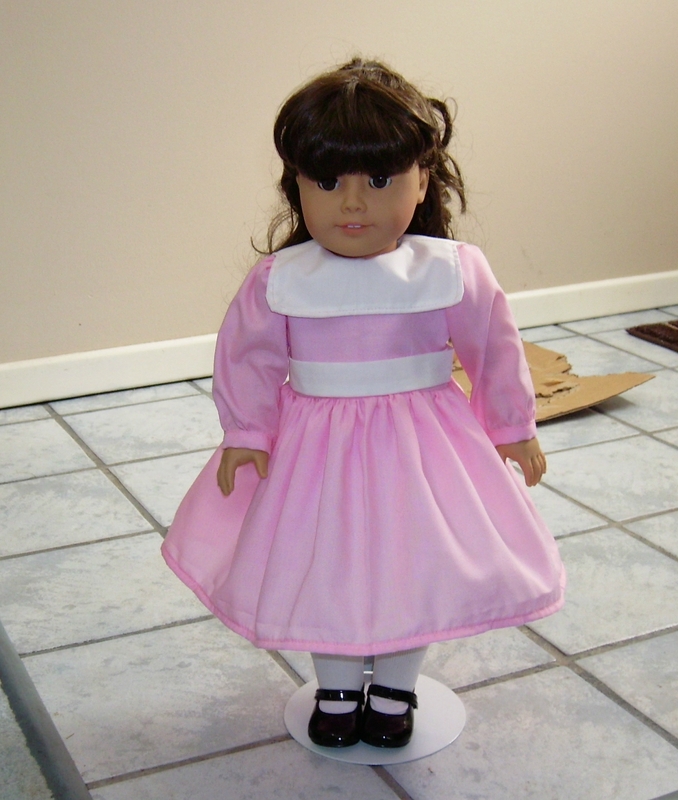 I will just owe Gabriella another outfit instead.